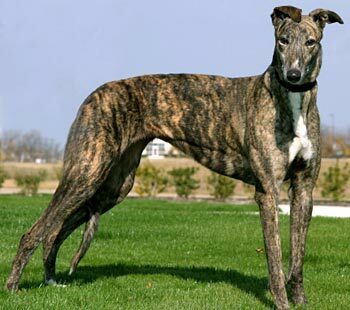 Chick, aka Runaway Chick, is a beautiful, 4½-year-old brindle female born July 10, 2004. Her sire is Dodgem By Design, making her grand sire the famous Gable Dodge, and her dam is Deco Babette (GALT's Babe), making her other grand sire the famous Molotov. Chick raced in 81 races beginning January 22, 2006 at Valley Race Park in Harlingen, Texas and ending in Dubuque, Iowa on October 27, 2007. After racing for almost two years, Chick is ready for something else – something a little more relaxing – long naps in the afternoon and lazy strolls through the neighborhood. This girl is quite a cutie with her very expressive ears. Chick will do best in a home without small children and would love to have a companion during the day, either human or larger canine. No Kitties for Chick: Chick was very exuberant in her barking and pouncing at the cats. After a period of time she kept going back to the last place she saw them and searching for them. Chick is not to be trusted with cats. We will see how trustworthy she is with small dogs at a later time. 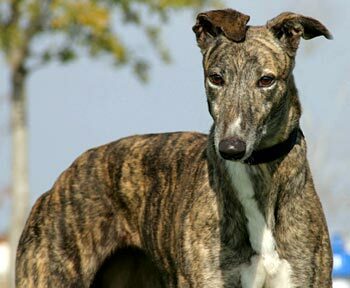 Chick is a gorgeous dark brindle with cute forward-flopping ears. 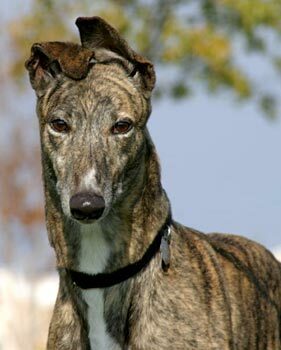 She is vocal for a greyhound. Pick up her leash, come across a rabbit on her walk, or sometimes just ring the doorbell and Chick will likely let out a few woofs to express her excitement. She has always been an enthusiastic walker, but we started jogging with her a bit when the weather was cooler and she really loves that. The flooring in our house is a mix of tile, wood and carpet. Chick soon learned the difference between grass and carpet, and has been solidly house trained for some time now. Chick plays exuberantly with toys; it's fun to watch her run around with the squeaky ones held high in the air, throw around the tennis balls, or settle down for a little gnaw on her rope pull toy. It's one of the times her personality really shines. Chick would rather play with toys than other dogs, but she plays well with toys with other dogs around. She's rather reserved about affection, preferring to stand quietly next to you for pats. Her favorite place to lay is on the mat right in front of the sink; she likes to keep a paw on the pulse of the household, and the kitchen is the heart of our house. She is still protective of her food bowl, but is very respectful of others' bowls and waits her turn for treats. For the first month, Chick was crated when we were gone. She was always quite calm when we returned. Since then, she has earned our trust and we are very comfortable letting her have the run of part of the house with the others while we are gone. She is not a big fan of the crate but will go in happily when it's time for a chew treat and waits patiently to be let out when she's done with it. Chick loves her walks! She is very confident and prefers to lead the way, but without pulling on the leash. She likes to do some sniffing, but is more interested in watching what other animals and people are doing. Squirrels are noted but ho-hum. Cats, some other dogs on leashes, and especially rabbits are a different story and often inspire her to exercise her vocal cords. She is good about responding to commands, but sometimes the excitement gets the better of her and we continue to work on this with her. Chick is very obedient. She comes when called and understands the concept of boundaries. We believe she would learn more formal commands (sit, stay etc.) easily. She is very observant about routines. Don't think for one minute that you can start to get ready for walkies or mealtime without her knowing it! Once the pre-walk routine begins, you will likely find her head between your legs so you won't be able to go anywhere without her. Chick has gradually bestowed her trust on us, and the more she does, the more her personality unfolds and blossoms. She's a real hidden treasure waiting for the right family to find the key to her heart.